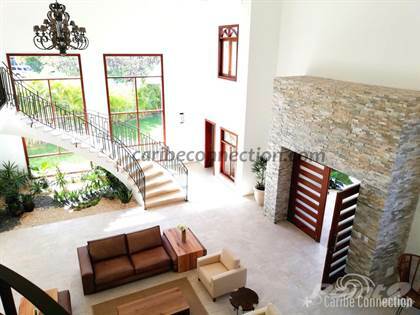 This magnificent villa is located in the Cocotal Golf & Country Club with fantastic views to the golf course from an exceptionally private corner lot of 1,677.76 M2, with impressive 656 M2 built of excellent quality materials and unique architecture.\r\rStep out to the swimming pool to enjoy the oasis that will be waiting for you! Two of the bedrooms on the top floor enjoy a terrific view, double height ceilings, spacious en suite bathrooms and terrace over looking the pool. There is a total of three bedrooms on the top floor and 2 bedrooms on the ground floor. All of them with en suite bathroom. The kitchen is very spacious with a nice window to the yard and a kitchen island. There is also a staff room with its own bathroom and service entrance. The garage has plenty of storage space.\r\rThe location is one of the best locations in town: Cocotal Golf & Country Club is one of the best gated communities of the whole Punta Cana area and its property owners can enjoy priviledged access to the Melia Tropical sport facilities, spa, beach club, swimming pools and private beach lounge area. \r\rThere are also special benefits exclusively for Cocotal Golf Property Owners: \r\r- Access to the beach and pool of the Meliá Caribe Tropical Hotel \r- Membership in the 'Gaby Beach' beach club \r- Access to the sports facilities \r- Access to the gym and sauna \r- 25% discount in all inclusive plans, Day pass and Night pass local rates \r\rAt the Cocotal Golf & Country Club: \r- Property owners can obtain a membership for US$1.000,00 / year / family. \r- Green fees worth US$25,00 per person, including golf cart \r- 10% discount in lessons \r- 10% discount at ProShop \r- 25% discount at the Club House and Beach Club consumptions \r\rSend us a message to find out more about this and other similar properties! Hi, I'd like to find out more information about Elegant and private corner 5-BDR villa with amazing golf course view. Thanks so much!